The extended Kalman filter (EKF) has been applied to inferring gene regulatory networks. However, it is well known that the EKF becomes less accurate when the system exhibits high nonlinearity. In addition, certain prior information about the gene regulatory network exists in practice, and no systematic approach has been developed to incorporate such prior information into the Kalman-type filter for inferring the structure of the gene regulatory network. In this paper, an inference framework based on point-based Gaussian approximation filters that can exploit the prior information is developed to solve the gene regulatory network inference problem. Different point-based Gaussian approximation filters, including the unscented Kalman filter (UKF), the third-degree cubature Kalman filter (CKF3), and the fifth-degree cubature Kalman filter (CKF5) are employed. Several types of network prior information, including the existing network structure information, sparsity assumption, and the range constraint of parameters, are considered, and the corresponding filters incorporating the prior information are developed. Experiments on a synthetic network of eight genes and the yeast protein synthesis network of five genes are carried out to demonstrate the performance of the proposed framework. The results show that the proposed methods provide more accurate inference results than existing methods, such as the EKF and the traditional UKF. Inferring gene regulatory network (GRN) has become one of the most important missions in system biology. Genome-wide expression data is widely used due to the development of several high-throughput experimental technologies. The gene regulatory network can be inferred from a number of gene expression samples taken over a period of time. Modeling of GRN is required before its structure can be inferred. Common dynamical modeling methods of GRN include Bayesian networks , Boolean networks , ordinary differential equations , state-space models [4, 5], and so on. Various approaches based on different models have been used to infer the network from observed gene expression data, such as the Markov Chain Monte Carlo (MCMC) methods for the dynamic Bayesian network model  and the ordinary differential equation model , as well as the Kalman filtering methods for the state-space model [4, 8] and the ordinary differential equation model . Some survey papers can be found in [9–12]. Due to the ‘stochastic’ nature of the gene expression, the Kalman filtering approach based on the state-space model is one of the most competitive methods for inferring the GRN. The Kalman filter is optimal for linear Gaussian systems. However, the GRN is generally highly nonlinear. Hence, advanced filtering methods for nonlinear dynamic systems should be considered. The extended Kalman filter (EKF) is probably the most widely used nonlinear filter which uses the first-order Taylor series expansion to linearize the nonlinear model. However, the accuracy of the EKF is low when the system is highly nonlinear or contains large uncertainty. The point-based Gaussian approximation filters have been recently proposed to improve the performance of the EKF, which employ various quadrature rules to compute the integrals involved in the exact Bayesian estimation. Many filters fall into this category, such as the unscented Kalman filter (UKF) , the Gauss-Hermite quadrature filter , the cubature Kalman filter (CKF) , and the sparse-grid quadrature filter . Besides the point-based Gaussian approximation filters, the particle filter has drawn much attention recently . The particle filter uses random particles with weights to represent the probability density function (pdf) in the Bayesian estimation and provides better estimation result than the EKF. The main problem of the particle filter is that the computational complexity is high, and therefore, it is hard to use for high-dimensional problems, such as the problem considered in this paper. The EKF and the particle filter have been used for the inference of GRN [4, 8, 18]. In this paper, we consider the point-based Gaussian approximation filters. Our main objective is to provide a framework of incorporating network prior information into the filters. For example, some gene regulations may be known  from literature and the inference accuracy of GRN can be improved by incorporating the known regulations of the GRN . Integration of the prior knowledge or constraints with the GRN inference algorithm has been introduced to improve the inference result. The DNA motif sequence in gene promoter regions is incorporated in  while modeling of transcription factor interactions is incorporated in . As mentioned in , experimentally determined physical interactions can be obtained. In addition, the sparsity constraint is frequently used in the inference of the GRN. To the best of the authors’ knowledge, the most related work in incorporating the prior information in Bayesian filters is . In that work, rather than directly getting the inference results from the filter, an optimization method is used. In particular, a cost function is used in which the sparsity constraint is enforced. However, the cost function in  does not consider the uncertainty of the state in the filtering. That cost function in fact is not coupled well with the filtering algorithm. In addition, it did not consider other kinds of prior information. In this paper, we propose a new framework that incorporates the prior information effectively in the filtering algorithm by solving a constrained optimization problem. Efficient recursive algorithms are provided to solve the associated optimization problem. The remainder of this paper is organized as follows. In Section 2, the modeling of gene regulatory network is introduced. The point-based Gaussian approximation filters are briefly introduced in Section 3. The proposed new filtering framework is described in Section 4. In Section 5, experimental results are provided. Finally, concluding remarks are given in Section 6. 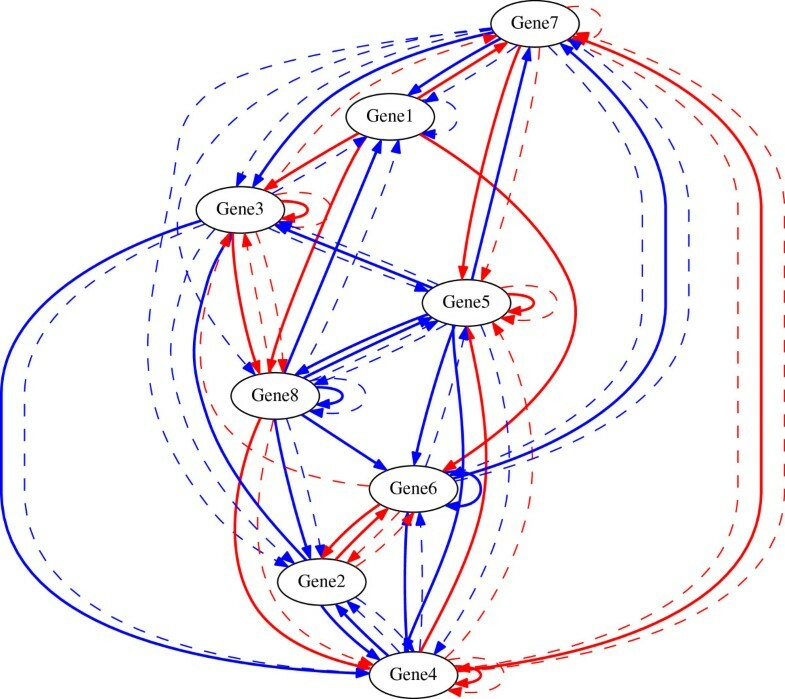 The GRN can be described by a graph in which genes are viewed as nodes and edges depict causal relations between genes. The structure of GRN reveals the mechanisms of biological cells. Analyzing the structure of GRN will pave the way for curing various diseases . The learning of GRN has drawn much attention recently due to the availability the microarray data. By analyzing collected gene expression levels over a period of time, one can identify various regulatory relations between different genes. To facilitate the analysis of the GRN, modeling of GRN is required. Different models can be used, such as Bayesian networks , Boolean networks , ordinary differential equation , and state-space model [4, 5]. The state-space model has been widely used because it incorporates noise and can make use of computationally efficient filtering algorithms . Thus, we also use the state-space modeling of GRN in this paper. where x k = [ x1,k,…,xn,k] T is the state vector and xi,k denotes the gene expression level of the i-th gene at time k. f is a nonlinear function that characterizes the regulatory relationship among the genes. v k is the state noise and it is assumed to follow a Gaussian distribution with mean 0 and covariance matrix Q k , i.e., v k ∼ N ( 0 , Q k ) . g i ( x ) = 1 1 + e - μ i x . In (2), A is the regulatory coefficient matrix with a ij denoting the regulation coefficient from gene j to gene i. Note that a positive coefficient a ij indicates that gene j activates gene i and a negative a ij indicates that gene j represses gene i. In (4), μ i is a parameter. Note that A and μ i are unknown parameters. The discrete-time nonlinear stochastic dynamic system  shown in Eqs. (1)-(3) have been successfully used to describe the GRN [4, 8]. Equation (4) is also called Sigmoid function which is frequently used since it is consistent with the fact that all concentrations get saturated at some point in time . The Sigmoid function has been used in modeling GRN to verify various methods, such as artificial neural network , simulated annealing and clustering algorithm , extended Kalman filter , particle filter , and Genetic programming and Kalman filtering . where h (·) is some nonlinear function, n k is the measurement noise, which is assumed to follow the Gaussian distribution with mean 0 and covariance matrix R k , i.e., n k ∼ N ( 0 , R k ) . For example, if the noise corrupted expression levels are observed, then h(x) = x. In this section, the framework of point-based Gaussian approximation filters for the state-space dynamic model is briefly reviewed. We consider the state-space model consisting of the state Equation (1) and the measurement Equation (5). We denote y k ≜ [ y 1 , … , y k ] . p ( x k | y k - 1 ) = ∫ p ( x k | x k - 1 ) p ( x k - 1 | y k - 1 ) d x k - 1 .
p ( x k | y k ) = p ( y k | x k ) p ( x k | y k - 1 ) ∫ p ( y k | x k ) p ( x k | y k - 1 ) d x k .
The pdf recursions in (6) and (7) are in general computationally intractable unless the system is linear and Gaussian. The Gaussian approximation filters approximate (6) and (7) by invoking Gaussian assumptions. Specifically, the first assumption is that given yk-1, xk-1 has a Gaussian distribution, i.e., x k - 1 | y k - 1 ∼ N ( x ̂ k - 1 | k - 1 , P k - 1 | k - 1 ) . The second assumption is that (x k ,y k ) are jointly Gaussian given yk-1. where ϕ x ; x ̂ , P denotes the multivariate Gaussian pdf with mean x ̂ and covariance P.
P k yy = E x k | y k - 1 ( h ( x ) - y ̂ k | k - 1 ) ( h ( x ) - y ̂ k | k - 1 ) T = ∫ h ( x ) - y ̂ k | k - 1 h ( x ) - y ̂ k | k - 1 T ϕ x ; x ̂ k | k - 1 , P k | k - 1 d x .
where P= S S T and S can be obtained by Cholesky decomposition or singular value decomposition (SVD). ξ k - 1 , i = S k - 1 γ i + x ̂ k - 1 | k - 1 .
ξ ~ k , i = S ~ k γ i + x ̂ k | k - 1 . Various numerical rules can be used to form the approximation in (16), which lead to different Gaussian approximation filters. In particular, the unscented transformation, the Gauss-Hermite quadrature rule, and the sparse-grid quadrature rules are used in the unscented Kalman filter (UKF), the Gauss-Hermite quadrature Kalman filter (GHQF), and the sparse-grid quadrature filter (SGQF), respectively. Recently, the fifth-degree quadrature filter has been proposed and shown to be more accurate than the third-degree quadrature filters, such as the UKF and the third-degree cubature Kalman filter (CKF3), when the system is highly nonlinear or contains large uncertainty . In this paper, we consider the UKF, CKF3, and the fifth-degree cubature Kalman filter (CKF5). Other filters such as the central difference filter  and divided difference filter  can also be used. The CKF5 is based on Mysovskikh’s method which uses fewer point than the fifth-degree quadrature filter in . In the following, different numerical rules used in (16) are briefly summarized. where κ is a tunable parameter, and e i is the i-th n-dimensional unit vector in which the i-th element is 1 and other elements are 0. ∫ h ( x ) ϕ x ; 0 , I d x = 1 π n / 2 ∫ h 2 x exp - x T x d x .
I h = ∫ h ( x ) exp - x T x d x .
where U n = s ∈ R n : ∥ s ∥ = 1 , and σ · is the spherical surface measure or the area element on U n .
Note that (31) contains two types of integrals: the radial integral ∫ 0 ∞ h r r r n - 1 exp - r 2 d r and the spherical integral ∫ U n h s ( s ) d σ ( s ) . I ( h ) ≈ ∑ i = 1 N r ∑ j = 1 N s w r , i w s , j h ( r i s j ) . ∫ h ( x ) ϕ x ; 0 , I d x ≈ 1 2 n ∑ i = 1 n h n e i + h - n e i . Remark: The third-degree cubature rule is identical to the unscented transformation with κ = 0.
p j ( i ) = - n + 1 n ( n - j + 2 ) ( n - j + 1 ) , j < i , ( n + 1 ) ( n - i + 1 ) n ( n - i + 2 ) , j = i , 0 , j > i.
s 2 ( i ) = n 2 ( n - 1 ) s 1 ( k ) + s 1 ( l ) : k < l , k , l = 1 , 2 , ⋯ , n + 1 . In the state-space model for gene regulatory networks described in Section 3.2, the underlying network structure is characterized by the n × n regulatory coefficient matrix A in (2) and the parameters μ = [ μ1,…,μ n ] in (4). The problem of network inference then becomes to estimate A and μ. To do that, we incorporate the unknown parameters A and μ into the state vector to obtain an augmented state-space model, and then apply the point-based Gaussian approximation filters to estimate the space vector and thereby obtaining the estimates of A and μ.
x ̄ k = f ̄ ( x ̄ k - 1 ) + v ̄ k = A k - 1 g k - 1 ( x k - 1 ) θ k - 1 + v k - 1 0 . Note that Ak-1 and gk-1 can be obtained from θk-1, and v ̄ k ∼ N ( 0 , Q ̄ k ) with Q ̄ k = diag Q k O n 2 + n , where O m denotes an m × m all-zero matrix. where B = [ I n , O n × ( n 2 + n ) ] , O n × ( n 2 + n ) denotes an n × (n2 + n) all zeros matrix. The point-based Gaussian approximation filters can then be used to obtain the estimate of the augmented state, x ̄ ̂ k , from which the estimates of the unknown network parameters, i.e., A ̂ and μ ̂ can then be obtained. which are the same as the filtering updates for Kalman filters. In practice, some prior knowledge on the underlying GRN is typically available. In this section, we outline approaches to incorporating such prior knowledge into the point-based Gaussian approximation filters for network inference. In particular, we consider two types of prior information, namely, sparsity constraints and range constraints on the network. For networks with sparsity constraints, we incorporate an iterative thresholding procedure into the Gaussian approximation filters. And to accommodate range constraints, we employ PDF-truncated Gaussian approximation filters. with J ( x ̄ ) ≜ y k - h ( x ̄ ) T R k - 1 y k - h ( x ̄ ) + x ̄ - x ̄ ̂ k | k - 1 T P k | k - 1 - 1 x ̄ - x ̄ ̂ k | k - 1 .
where J p ( x ̄ ) is a penalty function associated with the prior information and λ is a tunable parameter that regulates the tightness of the penalty. p ( A ) = ( λ / 2 ) n 2 exp - λ ∑ i = 1 n ∑ j = 1 n | a ij | . J ~ ( x ̄ ) = J ( x ̄ ) + λ ∥ A ∥ 1 . Note that (49) can also be interpreted as the result of applying the least squares shrinkage selection operator (LASSO) to (47). The LASSO adds an L1 - norm constraint to the GRN so that the regulatory coefficient matrix A tends to be sparse with many zero elements. J ~ ( x ̄ ) = J ( x ̄ ) + λ ∥ E ∘ A ∥ 1 . Note that as in , here we do not force a ij = 0 corresponding to e ij = 1 but rather use an L1 - norm penalty. The advantage of such an approach is that it allows the algorithm to pick different structures but more likely to pick the edges without penalties. ‘o’ denotes the entry-wise product operation of two matrices. Solving the optimization problems in (49) and (50) is not straightforward since |a| is non-differentiable at a = 0. In the following, an efficient solver called the iterative thresholding algorithm is introduced. where λ = [ λ 1 , λ 2 , ⋯ , λ n 2 + 2 n ] T and L ( x ̄ ) is a smooth function. Note that if λ = [ 0 1 × n , λ × 1 1 × n 2 , 0 1 × n ] T , then (51) becomes (49); and if λ = [ 0 1 × n , λ × θ ̲ ̂ , 0 1 × n ] T , then (51) becomes (50). Note that θ ̲ ̂ = e 11 , e 12 , ⋯ , e 1 n , ⋯ , e nn T .
x ̄ t + 1 = arg min z ( z - x ̄ t ) T ∇ L ( x ̄ t ) + α t 2 ∥ z - x ̄ t ∥ 2 2 + ∥ λ ∘ z ∥ 1 .
r t = ∇ L ( x ̄ t ) - ∇ L ( x ̄ t - 1 ) . is the soft thresholding function with sign(u) and max | u | - a , 0 being component-wise operators. x ̄ t + 1 = sign x ̄ t - 1 α t ∇ L ( x ̄ t ) max x ̄ t - 1 α t ∇ L ( x ̄ t ) - λ α t , 0 .
where ε is a given small number. If the range constraints on the regulatory coefficients are available, the inference accuracy can be improved by enforcing the constraints in the Gaussian approximation filters. c ≤ x ̄ ≤ d .
The PDF truncation method  can be employed to incorporate the above range constraint into the Gaussian approximation filters, by converting the updated mean x ̄ ̂ k | k and covariance Pk|k to the pseudo mean x ̄ ̂ k | k t and covariance P k | k t which are then used in the next prediction and filtering steps. G i D i 1 / 2 S i T e i = e i T P k | k , i t e i 1 / 2 , 0 , ⋯ , 0 . [ 1 , 0 , ⋯ , 0 ] z k , i ≤ d i - e i T x ̄ ̂ k | k , i t ( e i T P k | k , i t e i ) 1 / 2 ≜ d ~ i . [ 1 , 0 , ⋯ , 0 ] z k , i ≥ c i - e i T x ̄ ̂ k | k , i t ( e i T P k | k , i t e i ) 1 / 2 ≜ c ~ i .
with α i = 2 π [ erf ( d ~ i / 2 ) - erf ( c ~ i / 2 ) ] . σ i 2 = ∫ c ~ i d ~ i ( z - μ i ) 2 f ( z ) d z = α i exp ( - c ~ i 2 / 2 ) ( c ~ i - 2 μ i ) - exp ( - d ~ i 2 / 2 ) ( d ~ i - 2 μ i ) + μ i 2 + 1 . Q k , i = diag ( [ σ i 2 , 1 , ⋯ , 1 ] ) . P k | k , i + 1 t = S i D i 1 / 2 G i T Q k , i G i D i 1 / 2 S i T .
After imposing all n constraints, the final constrained state estimate and covariance at time k are given respectively by x ̄ ̂ k | k t ≜ x ̄ ̂ k | k , n t and P k | k t ≜ P k | k , n t .
and μ i = 2, i = 1,⋯,8. For the filter, each coefficient in A ̂ is initialized from a Gaussian distribution with mean 0 and variance 0.2. Moreover, the coefficient μ i is initialized from a Gaussian distribution with mean 1.5 and variance 0.2. The system state is initialized using the first measurement. where the number of true positives (TP #) denotes the number of links correctly predicted by the inference algorithm; the number of false positives (FP #) denotes the number of incorrectly predicted links; the number of true negatives (TN #) denotes the number of correctly predicted nonlinks; and the number of false negatives (FN #) denotes the number of missed links by the inference algorithm . The UKF with different parameter κ is tested. The simulation results based on 50 Monte Carlo runs are shown in Table 1. It can be seen that UKFs with κ=0,2,5 have slight better performance than UKFs with κ = -5,-2. One possible reason is that the weights of all sigma points used in the UKF are all positive when κ ≥ 0. In general, all positive weights will guarantee better stability of the filtering algorithm. However, it should be emphasized that, in this specific example, there is no big difference between UKFs with different κ. In addition, the objective of this paper was to investigate the proposed filter incorporating the prior information. Hence, the UKF is used to denote UKF with κ = 3 - n and compare with the filters incorporating the prior information. The inference results of the EKF, the UKF, the CKF3, and the CKF5 are summarized in Table 2, all results are based on 50 Monte Carlo runs. It can be seen that all point-based Gaussian approximation filters have better performance than the EKF since the average(avg) FPR is lower and the average TPR and precision are higher than that of the EKF. Although the CKFs exhibit slightly better filtering performance than the UKF in some runs, they are comparable in terms of TPR, FPR, and PPV. Based on the above tests, in the rest of the paper, only the UKF is used. As mentioned above, the UKF is used as a typical filter to compare the performance with and without the prior information. E = 0 0 0 0 0 0 0 0 1 0 0 0 1 0 1 0 0 0 0 0 0 0 0 0 0 0 0 0 0 0 0 0 0 0 0 0 0 0 0 0 0 0 0 0 0 0 0 0 0 1 1 0 0 0 0 1 0 0 0 0 0 0 0 0 . The comparison of the UKF and the UKF incorporating the existing network information (denoted by UKFp 1) with λ = 2 is shown in Table 3. It can be seen that the average TP # and TN # of the UKFp 1 are both higher than those of the UKF. In addition, the average FP # and FN # of the UKFp 1 are lower than those of the UKF. Hence, the UKFp 1 predicts more correct links and nonlinks than the UKF. Moreover, the UKFp 1 produces less incorrect links and missed links than the UKF. The average TPR and the precision of the UKFp 1 are higher than those of the UKF. In addition, the average FPR of the UKFp 1 is lower than that of the UKF. Hence, by using the existing network information, the inference accuracy can be improved. The performance of UKFp 1 with different λ is shown in Table 4. It is seen that the performance of UKFp 1 and UKF is close when λ is small since only small regulation is imposed on the solution. When λ is large, the difference between the UKFp 1 and UKF is large. In particular, the UKFp 1 provides sparser solution than the UKF when λ is large. It can be seen from Table 4, the average FPR of UKFp 1 decreases with the increasing of λ. The average TPR of UKFp 1, however, does not increase monotonically with the increasing of λ. The average PPR of UKFp 1 increases with the increasing of λ. Hence, roughly speaking, the UKFp 1 is better than the UKF when large λ is used. To consider the strength of the links, rather than setting it to 1, e ij (in the indicator matrix E) is set to different values. Large e ij is used if the strength of the link from gene j to gene i is strong. For convenience, the UKF considering the strength of links is denoted as UKF p ̂ 1 . To compare the performance of UKF p ̂ 1 with UKFp 1, for UKF p ̂ 1 , the values of the second row in Equation (79) is multiplied by 5. 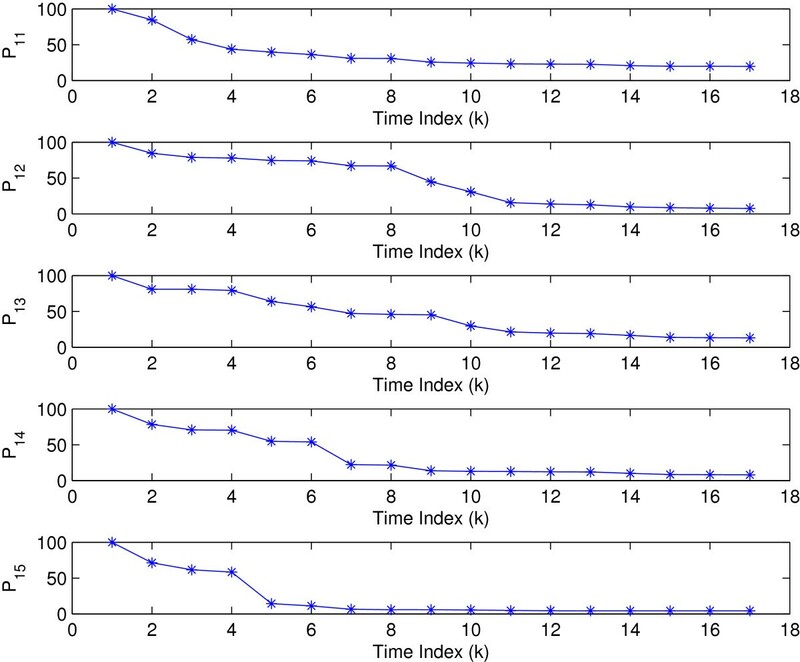 The performance of UKF p ̂ 1 using different λ is given in Table 5. It can be seen from Tables 4 and 5 that the performance of UKF p ̂ 1 and UKFp 1 is close when λ is small, e.g., λ = 0.1. In addition, the average TPR and FPR of UKF p ̂ 1 is smaller than that of UKFp 1 for all tested λ except for λ = 0.1. Hence, PPR is used to evaluate the performance of UKF p ̂ 1 and UKFp 1. Although the average PPR of UKF p ̂ 1 and UKFp 1 is close when the λ is large, e.g., λ = 10, the average PPR of UKF p ̂ 1 is consistently higher than that of UKFp 1. The results indicate that the inference accuracy of UKF p ̂ 1 and UKFp 1 are close when λ is very small or very large. The inference accuracy of UKF p ̂ 1 outperforms UKFp 1 when the appropriate strength of the link and parameter λ are used. To consider the effect of false prior knowledge, the second row of the indicator matrix in Equation (79) is changed to [ 0,1,1,1,0,1,0,1], which conflicts with the truth. For convenience, we use UKF p ̄ 1 to denote the UKF incorporating this false prior knowledge. In Table 6, the performance of UKF p ̄ 1 with different λ is shown. It can be seen from Tables 4 and 6 that the average TPR of UKF p ̄ 1 is smaller than that of UKFp 1 when λ is small, e.g., λ = 0.1,0.5. In addition, the average FPR of UKF p ̄ 1 is larger than that of UKFp 1 when λ is large, e.g., λ = 5,10. Moreover, although the average PPR of UKF p ̄ 1 is close to that of UKFp 1 when λ is small, the average PPR of UKF p ̄ 1 is consistently lower than that of UKFp 1. Hence, as expected, the results indicate that the false prior knowledge will lead to worse inference result. Incorporating LASSO The problem setup is the same as before except that the LASSO rather than the existing network information is used. The UKF incorporating LASSO is denoted as UKFp 2. As shown in Table 3, the average TP # and FP # of UKFp 2 are lower than those of UKF and the average TN # and FN # of UKFp 2 are higher than those of UKF. Hence, UKFp 2 produces less links, including correct and incorrect ones. In addition, UKFp 2 produces more nonlinks and missed links. It is consistent with the fact that the LASSO tends to provide a sparse solution. It can be seen from Table 3 that the average FPR of UKFp 2 is lower than that of UKF and the average precision of UKFp 2 is higher than that of UKF. Hence, by incorporating LASSO, the inference accuracy is improved. A representative inference result of UKFp 2 and the true regulations are shown in Figure 1. For comparison, the inference result of UKF and the true regulations are shown in Figure 2. 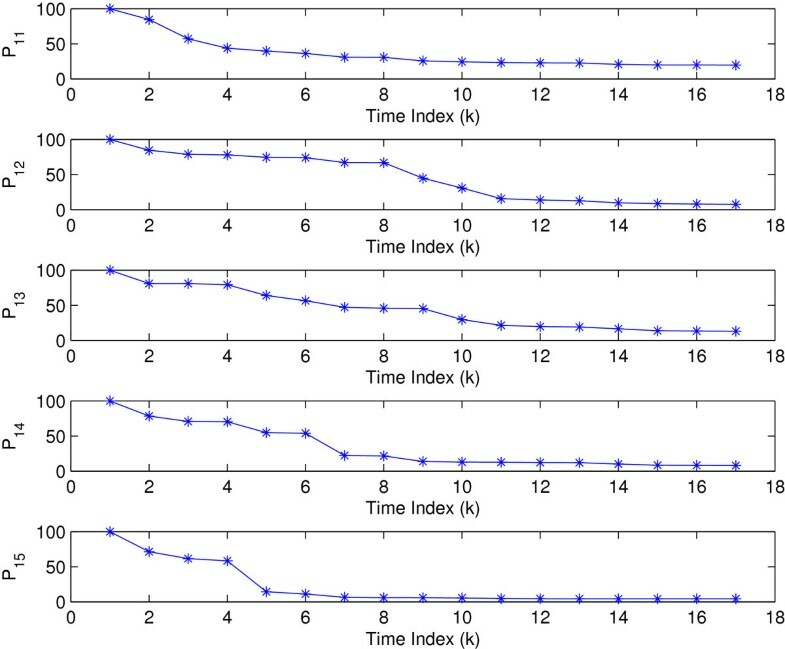 By comparing Figure 2 and Figure 1, it can be seen that UKF falsely predicts the nonlinks from gene1 to gene2, from gene3 to gene6, from gene4 to gene8, from gene5 to gene2, and from gene6 to gene4 while UKFp 2 does not. Inferred regulations of UKF p 2 and true regulations. Inferred regulations of UKF and true regulations. The performance UKFp 2 with different λ is shown in Table 7. It is seen that the performance of UKFp 2 and UKF is close when λ is small since only small regulation is imposed on the solution. When λ is large, the difference between UKFp 2 and UKF is large. The average TPR and FPR of UKFp 2 decrease with the increasing of the λ. The average PPR does not increase monotonicallly with the increasing of λ. Generally speaking, for different λ, UKFp 2 is more sensitive than that of UKFp 1. Although the performance of UKFp 2 depends on λ, the average PPR of UKFp 2 is consistently higher than that of UKF. Hence, roughly speaking, UKFp 2 has better performance than UKF. Incorporating the range constraint The existing network information can be used to provide the rough range constraint of x ̄ . A tight constraint is forced on the regulation coefficient a ij when there is a small regulation possibility from genej to genei and a loose constraint is forced on the regulation coefficient with no prior information. In the simulation, for the coefficients corresponding to the zero elements in (79), the lower bound and the upper bound are set as -10 and 10, respectively. For the coefficients corresponding to the nonzero elements in (79), the lower bound and the upper bound are set as -0.1 and 0.1, respectively. The UKF incorporating the range constraint is denoted as UKFp 3. As shown in Table 3, the average FPR of UKFp 3 is lower than that of UKF and the average precision of UKFp 3 is higher than that of UKF. Pathway model of the five genes in yeast protein synthesis network. The GRN is inferred by the UKF and UKFp 2. The predicted gene expressions using parameters estimated by UKFp 2 and the true measured gene expressions are shown in Figure 4. It can be seen that the model output fits the measured data well. The variances of the regulatory coefficients of HAP1 (P1i (1 ≤ i ≤ 5)) are shown in Figure 5. It can be seen that the filter converges since the variance P1i approaches zero. The results for other regulatory coefficients are similar and not shown here. The evaluation of the inferred GRN by UKF and UKFp 2 is shown in Table 8. True gene expression and model output. By incorporating the sparsity constraint, UKFp 2 provides much better inference results than UKF. As shown in Table 8, the TP # and TN # of UKFp 2 are higher than those of UKF and the FP # and FN # are lower than those of UKF. In addition, it can be seen from Table 8, the FPR of UKFp 2 is lower than that of UKF and the TPR and the precision of UKFp 2 is higher than that of UKF. In this paper, we have proposed a framework of employing the point-based Gaussian approximation filters which incorporates the prior knowledge to infer the gene regulatory network (GRN) based on the gene expression data. The performance of the proposed framework is tested by a synthetic network and the yeast protein synthesis network. 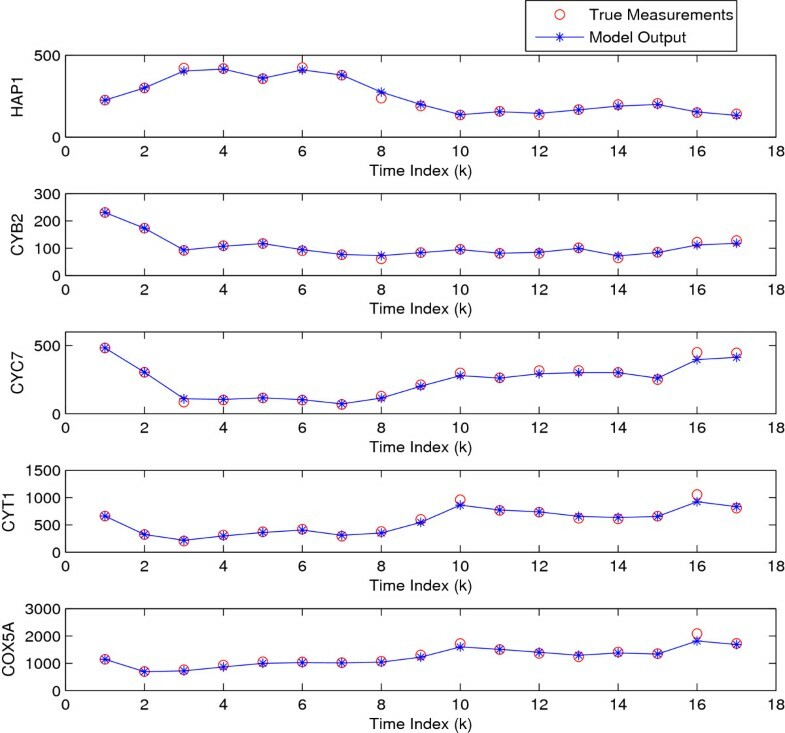 Numerical results show that the inference accuracy of the GRN by the proposed point-based Gaussian approximation filter incorporating the prior information is higher than using the traditional filters without incorporating prior knowledge. The proposed method works for small- and medium-size GRNs due to the computational complexity considerations. 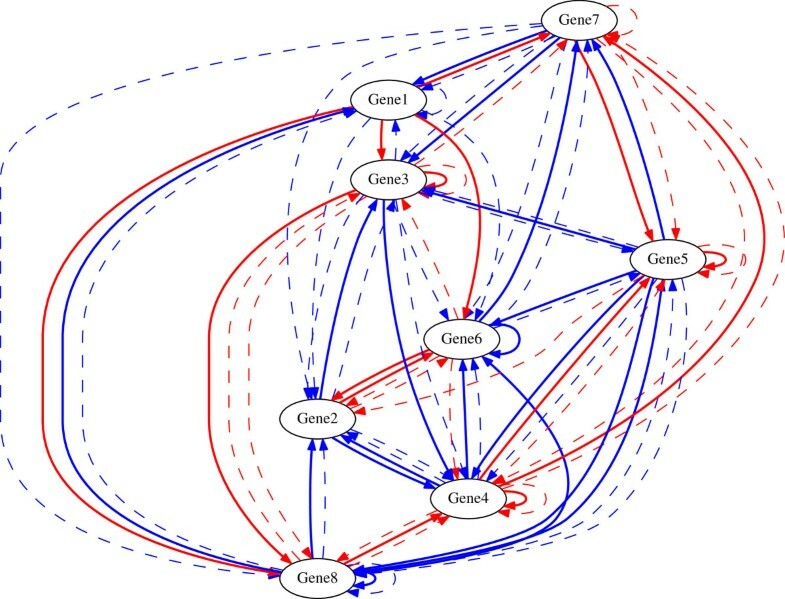 It remains a future research topic how to adapt the proposed inference framework to handle large GRNs at reasonable computational complexity.